Which Style of Driveway Gate is Right for Your Home? There are many driveway gates that can help add security and beauty to your home. We specialize in custom gates that can be created to exactly meet your needs. There are many styles to choose from, the most popular of which we have listed below. If you have other questions, or you are ready to get started, you can reach Dynamic Garage Door at 855-343-3667. A swing gate, as the name implies, swings open. It uses a hinged opening motion that is stationary on one end and the other end swings open or closed. One of the reasons that clients choose swing gates over other options is because they tend to be one of the most affordable options. Once again, a sliding gate is just what the name implies: A gate that slides. It is often chosen when there isn’t enough room for a gate to swing open. Sliding gates are also more secure and so are more often chosen when higher security is needed. In most cases, this type of gate will go along with a fence and will open parallel to it. This is a form of swinging gate. Think of it as the type of gate that is used to control who can access a parking garage. It involves a four-fold door panel that can fold completely to leave the opening clear the entire time the driver is exiting the driveway. These are more expensive options but they greatly reduce the risk of a gate harming a vehicle or a vehicle harming a garage door. If your main goal is control which vehicles can access the driveway, then barrier gates are a good choice if the sliding gate is not a possibility due to limited space. There are numerous options within the category of barrier gates, including vertical pivot gates that lift vertically. Do you see any particular style of gate that interests you? If so, we can customize it for your exact needs. If not, we can create the perfect gate for you. We can even create a custom garage door that matches your gate. Remember we can build shutters, hardware, and more. If you are ready to learn more about your options then we look forward to helping you. Just reach out Dynamic Garage Door at 855-343-3667 or come to our showroom. With many years of experience and a commitment to customer satisfaction, we are confident that we can provide exactly what you are looking for. 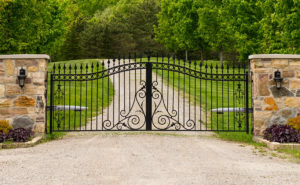 Home » Blog » Which Style of Driveway Gate is Right for Your Home?